Before the non-Indians came, tribes managed the natural resources and protected them. We were taught that if you take care of the land and the resources, the land will take care of you. My strength is from the fish; my blood is from the fish, from the roots and berries. The fish and game are the essence of my life. I was not brought from a foreign country and did not come here. I was put here by the Creator. I don’t believe in magic. I believe in the sun and the stars, the water, the tides, the floods, the owls, the hawks flying, the river running, the wind talking. They’re measurements. They tell us how healthy things are. How healthy we are. Because we and they are the same. That’s what I believe in. We are standing on the washed-out county road next to Sahale, our community home, with a dozen people from Washington State Fish and Wildlife, the county road department, and the Hood Canal Salmon Enhancement Group. I ask, “So with the flood, the salmon stream has jumped its banks and is now flowing through our meadow. Would it be OK if we just let it stay there?” After some exploration of the situation the answer was, “Yes!” This is the story of how a historic Northwest storm brought us our very own salmon stream to shepherd. 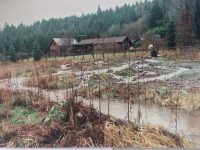 Members of the Goodenough Community, long dreaming for land for a residential community and a retreat center, found our rural land in 2001 and named it Sahale Learning Center and EcoVillage. With 68 acres bordering on the Tahuya River, we became stewards not only of the land but of the salmon who swim from the Hood Canal up the river each year to spawn. North of Sahale, a creek ran down from Jiggs Lake, through the ravine, under the county road, and then along the property line north of us on Fish and Wildlife property which houses a salmon hatchery. The creek continued down to the Tahuya River through wetlands on the state property. In early December of 2007 a major storm came through western Washington, now officially named the “Great Coastal Gale of 2007.” This caused landslides and flooded many places including putting parts of Interstate 5 underwater. The Tahuya Peninsula and Sahale were completely cut off for several days. None of us were out there when the storm hit and we had to call a neighbor to come down and feed our dog, Sam. When we did get out to Sahale the Jiggs Lake Creek was filled with many feet of rock and gravel from a massive mudslide up the ravine, and part of the road was caved in. The salmon hatchery had broken pipes and the salmon fry that would have been released in February were lost. Downstream where I lived, I walked out on the back porch and could see that the flooding Tahuya River covered the entire meadow beyond. The Jiggs Lake Creek had jumped its banks and had changed from a gentle stream to a small river also flowing through the meadow. We found one of the old stream outlets into the river and cleared out rock and gravel and tried to create a dike. As is the way with nature, the stream still went out of its bed every winter with regular flooding. Salmon were flopping around all over the meadow and back yard. I’ll never forget picking up huge slimy wriggling fish and running to the stream to toss them back in. I contacted the director of the salmon enhancement group, which is restoring native runs of salmon in our region. I asked him about diking and clearing rocks from the stream to create a channel. He had a stream engineer create drawings of the perfect salmon stream. When I had someone out who could do the work he told me it would be $30,000. Please. He also said, don’t bother, just let the stream create its way naturally over time. A good idea which proved to be correct. In 2011, the salmon enhancement group received a grant to drop 60 Douglas firs, roots and all, into selected spots along the Tahuya River to help form deeper channels for salmon habitat. The river had flattened out and was shallower than was good for the salmon. They used our largest meadow as a staging ground to collect all the trees and then selectively placed them in the river from a Chinook helicopter. They also placed two large trees on the south side of the salmon stream, creating a much more permanent dike that was been very effective over the years. Yearly, we did plantings of native trees, shrubs, and grasses along the stream. Willows naturally started to populate and we put out more willow stakes to fill in until the larger trees took off. Unfortunately, nature was also planting reed canary grass, blackberries, and other invasive plants faster than we could get our trees and shrubs established. With the blackberries in some places growing higher than us, it can sometimes feel like one step forward, two steps back. A meditation on nature’s inexorable path to abundance is good to do when we’re out there. The beavers cut down several maturing trees and have chopped down the same cottonwood three times so far, moving the wire cage right off it. And yet there are cedars, willows, cottonwood, Oregon ash, native hawthorn, shore pines, ninebark, salmonberry, serviceberry, Nootka roses, Douglas spirea, dogwood, and many other plants growing on the stream banks, providing stream protection and abundant food for wildlife. In the process of stewarding a salmon stream, we have made friends with some people from county agencies. They love that we want to work with them and we have learned so much about protecting salmon. One year several Sahale residents volunteered at the hatchery, checking the salmon fry daily and helping to release them into the stream. Collaboration with the County Noxious Weeds team led to a day of volunteer blackberry clearing on our stream. Most of all every year the salmon return and make their way up the stream. We can see them spawning right in front of us. Every winter and spring the small fry are in the stream on their way to what is a several years’ journey to the ocean before they return. Sometimes we see steelhead coming up. The heron comes by daily at times; river otters poke their heads up. The beavers shop for trees; deer graze along the streamside nipping off our new growth. It’s a balance. Many birds make their homes along the stream. Ravens, turkey vultures, and eagles fly overhead and hawks perch on the tall cottonwood and maples. The stream always changes course and there will always be some flooding and marshland. When I sit on my porch and look out I see an entirely different landscape from when I first moved here. Then I saw a grassy meadow that covered the entire area. Now this land is covered with trees, shrubs, and wetland—a whole new habitat is moving in. This is the story of one of our sacred spots at Sahale. Living so close to the stream and always hearing it running by, I find it is dear to my heart. And when I am long gone, there will be tall trees, and well-established understory. No matter how many blackberries we cut down there will still be berries to eat. I hope there will always be some people who enjoy maintaining this very special place on our Sahale land.